One of my cartoons is the Beat the Cartoonist image in the January Reader's Digest, allowing readers to write their own captions then vote on the best. Cartoon advent calendar: Day 24. 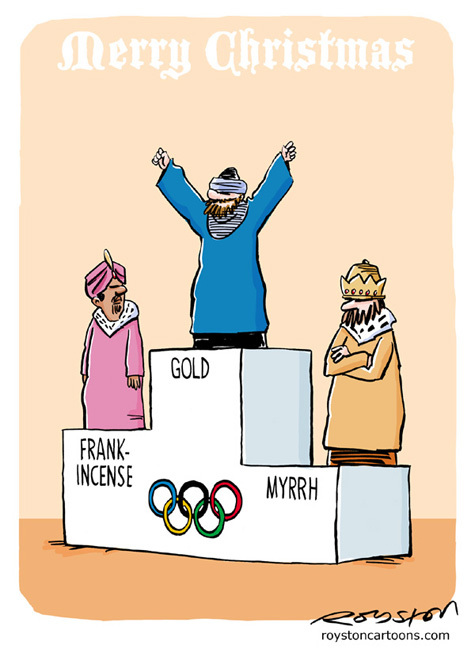 Here's the final advent calendar cartoon. This was my Christmas card this year, and like the drawing from day one, the gag was in the Christmas issue of Reader's Digest. I picked this as the final one as it looks forward to 2012. Thanks for reading and a merry Christmas and a happy new year to you all! 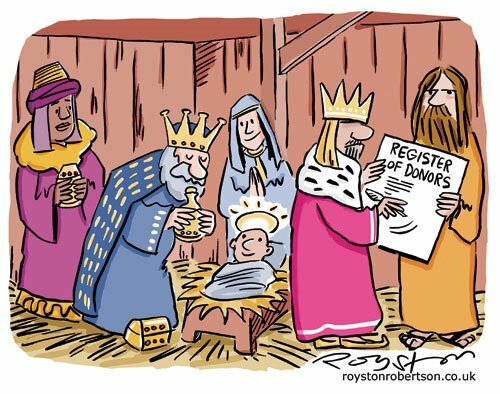 Today's advent cartoon is another from the Christmas Private Eye. 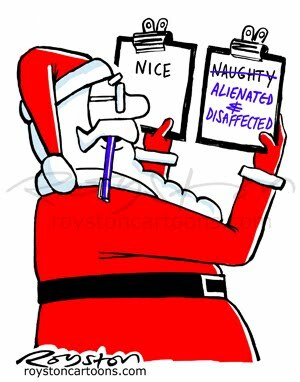 I did one similar to this a few years ago, which didn't sell, where he had three lists: Nice, Naughty and Misunderstood. But it seemed right to rework it this year in the light of the riots across England, after which people were searching for reasons for young people going on the rampage. "Alienated" and "disaffected" were words used by Tony Blair in a post-riots speech. 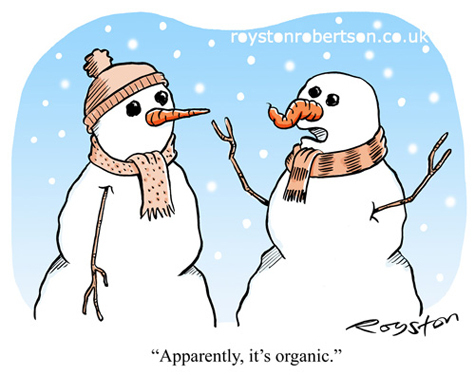 Day 18 of the cartoon advent calendar and this is the fourth snowman joke, and there may well be more to come. 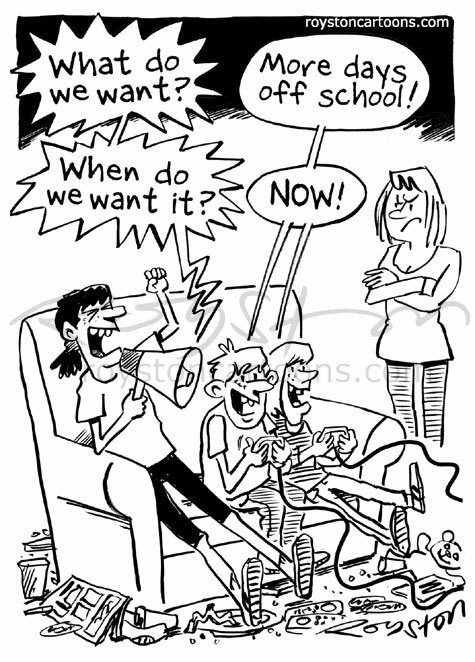 This was in Prospect magazine at Christmas two years ago. "You must come over to ours for Boxing Day." 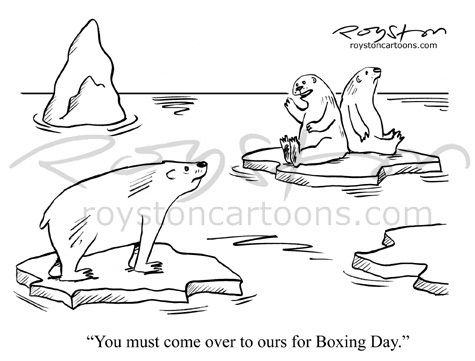 This is one from a couple of years ago when there were lots of cartoons depicting polar bears on floating bits of ice. Maybe editors had had their fill though, as it didn't sell. Or maybe they thought that worrying about global financial crisis at Christmas time is enough, without also worrying about global warming. 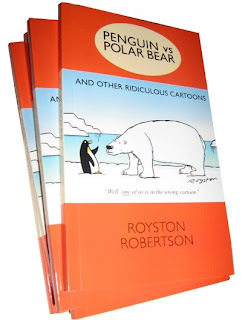 To avoid a Frozen Planet controversy, I should point out that this is not a real depiction of polar bears, it's just a drawing. 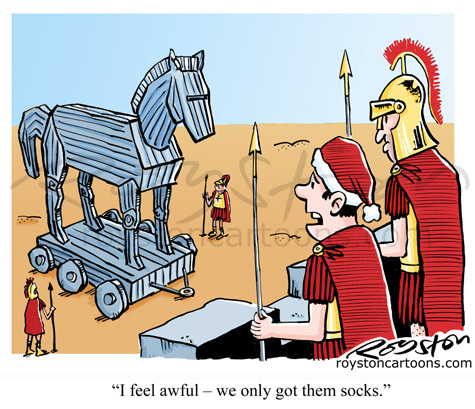 "I feel awful -- we only got them socks." Back to the present for today's advent cartoon. This is in the new edition of Prospect. "Oi! 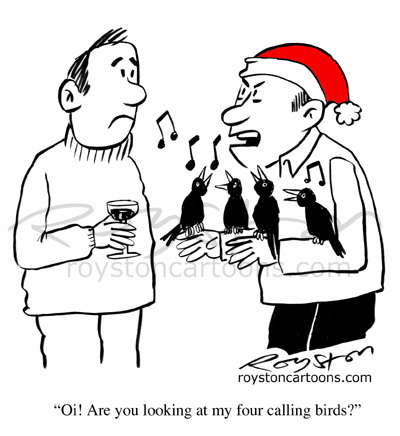 Are you looking at my four calling birds?" 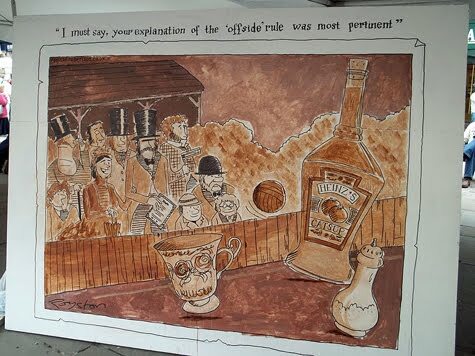 For some reason that is lost in the mists of time, in 2008 Private Eye was keen to run gags, by different cartoonists, that used the caption "Oi! Are you looking at my bird? ", and variations thereof. So I thought they might go for a festive take on that. They didn't. 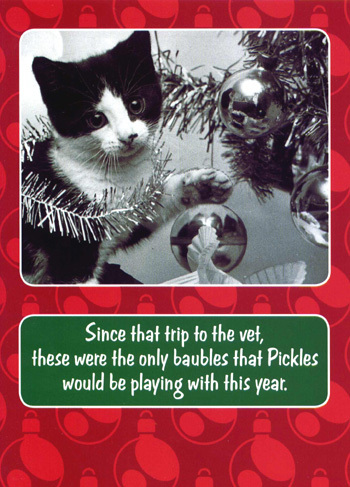 "Since that trip to the vet, these were the only baubles that Pickles would be playing with this year." I know what you're thinking ... that's not a cartoon! But I did write the caption for this Christmas photo card. 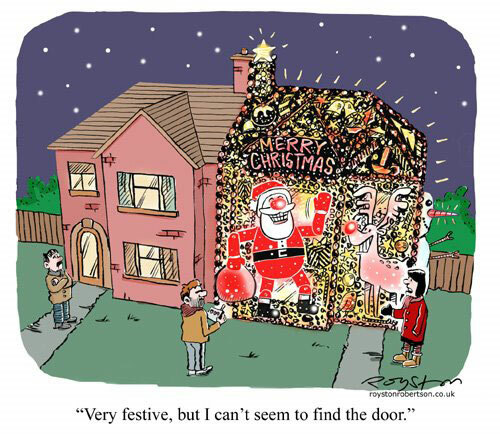 "Very festive, but I can't seem to find the door." Believe it or not, this one can currently be seen on a Christmas tree in a church! St George's Church in Ramsgate asks local organisations to decorate trees every year, as a fundraising event, and Ramsgate Arts, for whom I did a talk, a couple of years ago, approached local artists to contribute images for theirs. 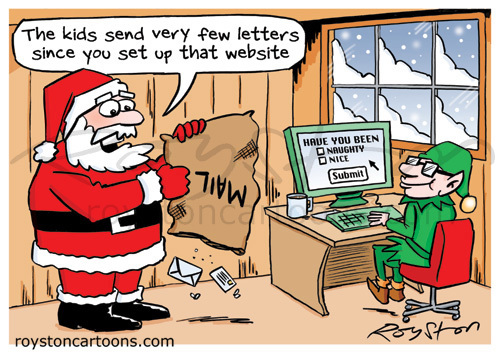 This was also Prospect magazine's Christmas card in 2008. 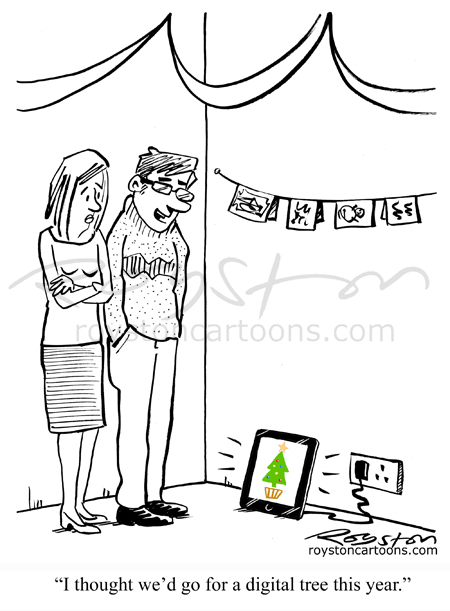 "I thought we's go for a digital tree this year." 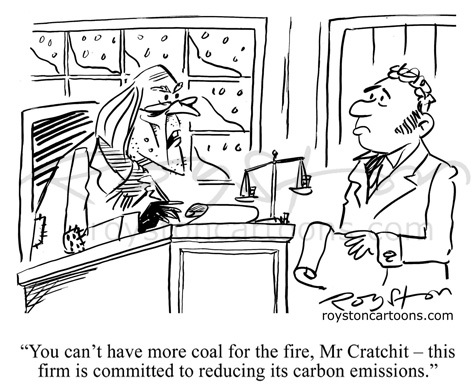 Back up to date, todays advent cartoon is in this week's issue of the Spectator. 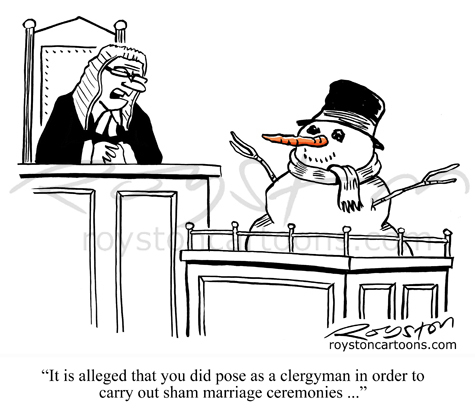 "It is alleged that you did pose as a clergyman in order to carry out sham marriage ceremonies ..."
After the punnery of yesterday's advent cartoon, this one is possibly a little more sophisticated -- by which, I mean that some people didn't get it. 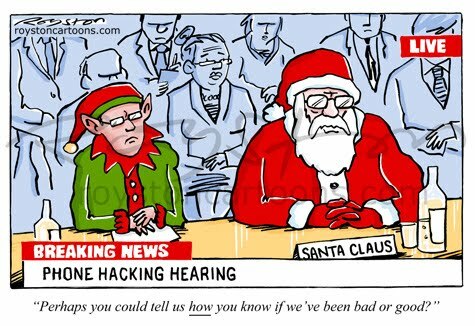 Private Eye did though, and it was in the magazine last Christmas. 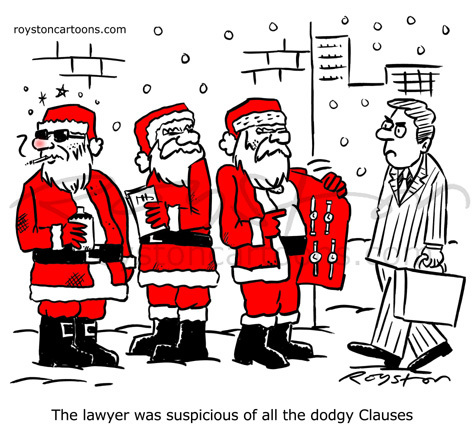 "The lawyer was suspicious of all the dodgy Clauses." 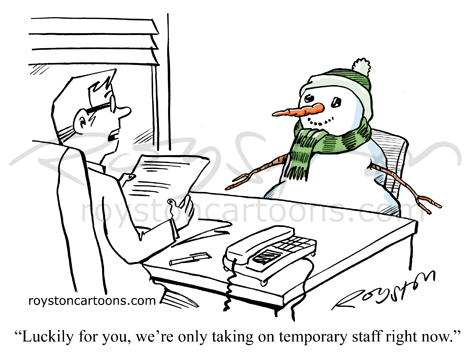 This was a cartoon for a law firm's Christmas card from 2006, though it was reused again this year by another law firm that had seen it on my portfolio site. Which was nice. 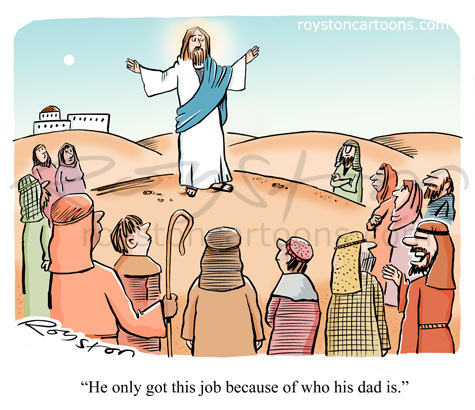 Day five, and here's the first religious cartoon. 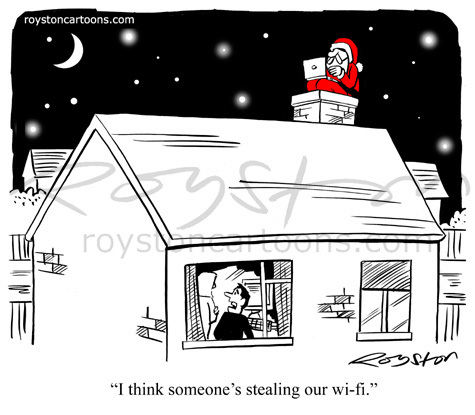 This is from Christmas 2007 and was in Prospect magazine. There was a lot of stuff in the media at the time about MPs and donations, members' interests etc. Christmas shopping? Why not get them a book they'll actually read this year! 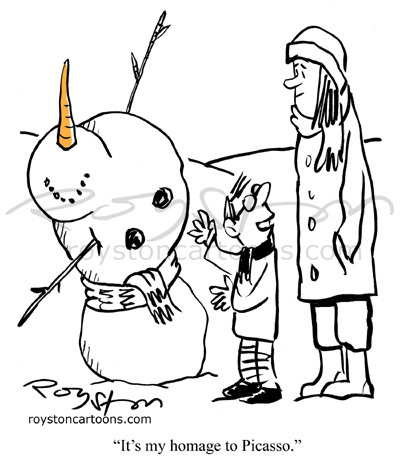 Today's advent cartoon is an oldie. 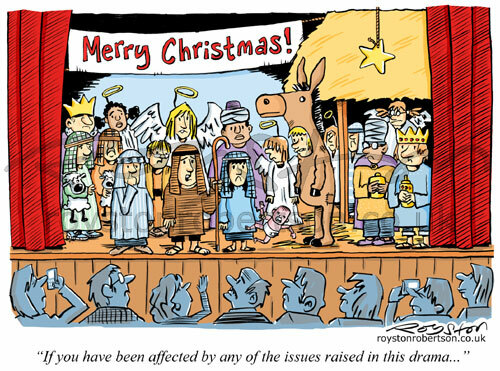 This was in a Private Eye Christmas issue in 2008. Day three and I'm already revisiting past glories! 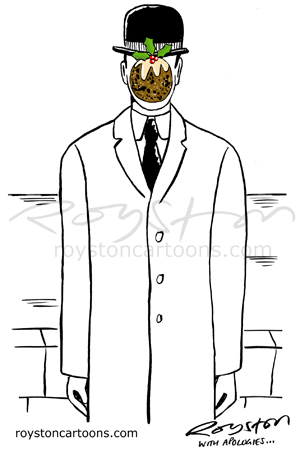 Mind you, I don't think I've posted this here before, though there are other Magritte cartons. 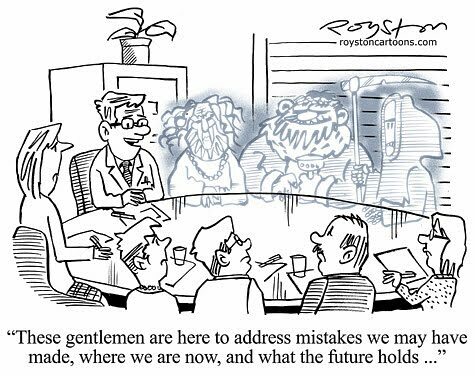 "These gentlemen are here to discuss mistakes we may have made, where we are now, and what the future holds ..."
Here's today's advent cartoon. 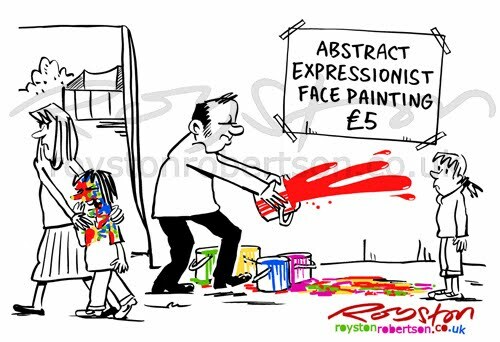 This was drawn for a trade publication, to be sent out as part of an e-card, and is one of my regular boardroom series of cartoons. It's fun sometimes to drop new characters into the regular scenario, and often the jokes almost write themselves. For the current economic climate, the Ghosts of Christmas Past, Present and Future seemed appropriate, particularly as Future, with his scythe, gives us an indication of what's to come: i.e. more cuts. Merry Christmas, indeed. I'm going to treat you lucky people to a Christmas cartoon for each day leading up to December 24 -- a kind of cartoon advent calendar. 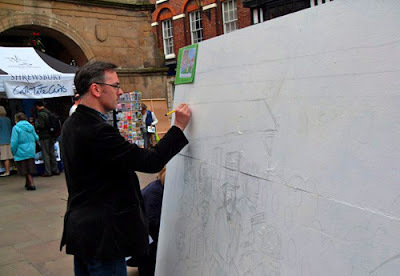 They will be new and old, published and unpublished, some from magazines and others commissioned. To kick things off, this is in the Christmas issue of Reader's Digest. 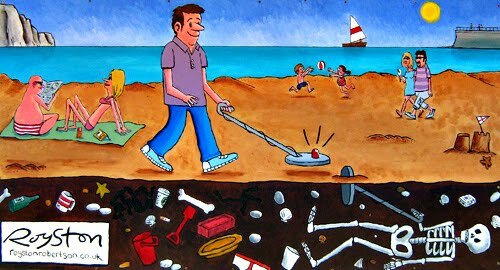 Any resemblance to living people is purely coincidental etc etc. 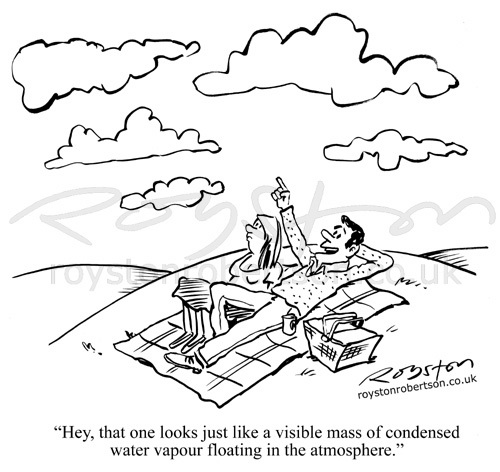 I think this is the only cartoon I've done where the speaker is not in the cartoon. I wasn't sure it would work, but I think we're so used to seeing this kind of televised public grilling now, such as the current Leveson Inquiry, that I get away with it. 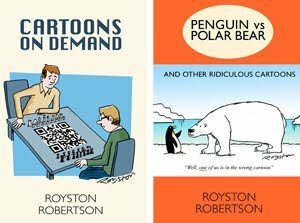 Give the gift of a Royston cartoon book this Christmas! Penguin vs Polar Bear and Other Ridiculous Cartoons is 104 pages long and has lots of funny cartoons in it, taken from Private Eye, Reader’s Digest, The Spectator, Prospect, The Oldie, New Statesman and others. Visit my shop to buy a signed copy for £5.99 plus £2 p+p. It's also available at the Cartoon Museum shop in London, and at their online store. Plus you can buy it at Amazon.co.uk, Amazon.com and Lulu.com. There's even a bargain-price digital download version available. Having a sort out, I came across some old paintings I did in an evening class a few years ago. 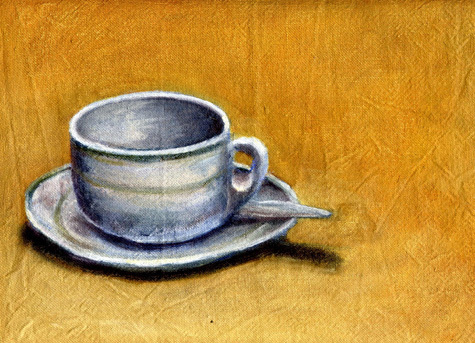 Here's one: a still life of a tea cup. Painted on an old tea towel, I kid you not. This is from my Typhoo period. Sugar, anyone? 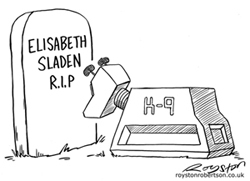 I had some fun doing this cartoon, which can be seen on the Doctor Who fansite Adventures with the Wife in Space. 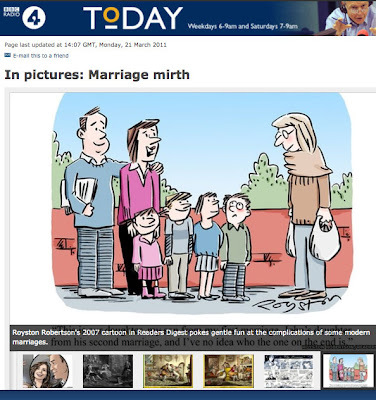 The site is run by Neil Perryman, an old friend from my university days, who commissioned me via Facebook, having seen me banging on (and on) about my cartoons there. 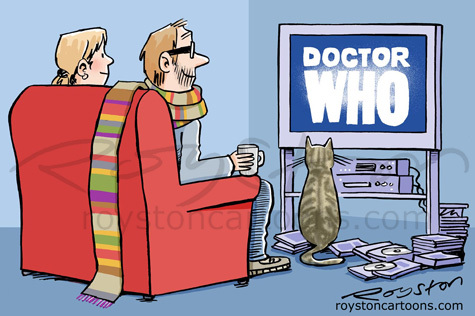 The idea behind the site is that every day he watches an episode of Doctor Who with his non-fan wife Sue, in order from the very beginning, and records her reactions, which are mostly sarcastic and very funny. They're on to Jon Pertwee now: check it out. 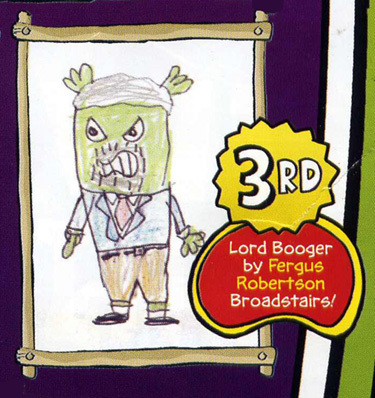 Regular readers of this blog will know that I'm not averse to drawing the odd Doctor Who-based cartoon. 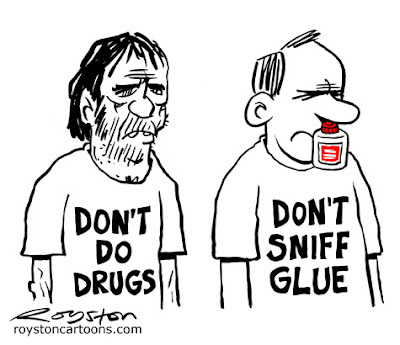 Here's a cartoon that comprehensively breaks the unwritten rule that captions should be snappy and to the point. 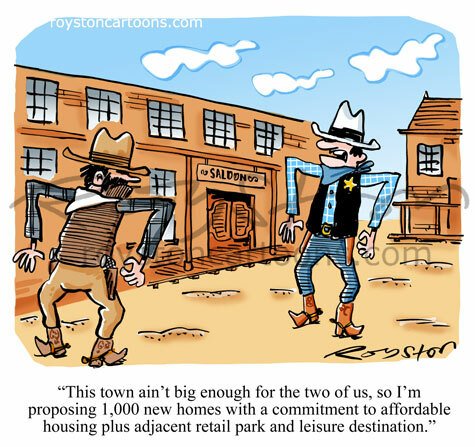 "This town ain't big enough for the two of us, so I'm proposing 1,000 new homes with a commitment to affordable housing plus adjacent retail park and leisure destination." I spent quite a bit of time trawling local council websites to get the deathlessly dull phrases that they use right. "Leisure destination" is a particularly annoying one. This can be seen in the November issue of Reader's Digest. "What are we running for? 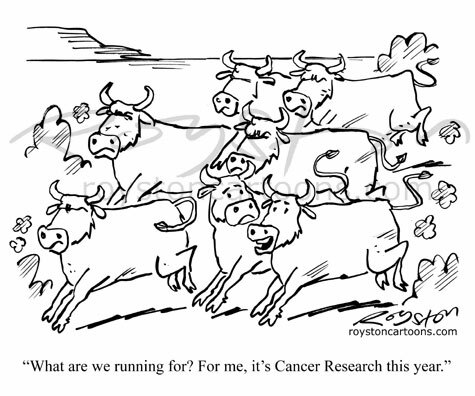 For me, it's Cancer Research this year." The Private Eye Annual 2011 is in the shops, and I've got a couple of cartoons in it, including the one above. 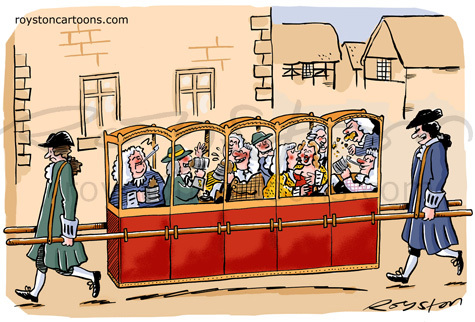 This cartoon illustrates that submitting cartoons is often about timing. 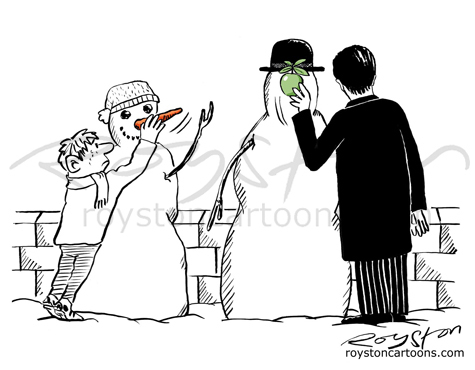 I drew it about a year ago but it seemed like the wrong time to be sending it out, as we headed into winter, and no-one would be thinking about "fun runs" any time soon. 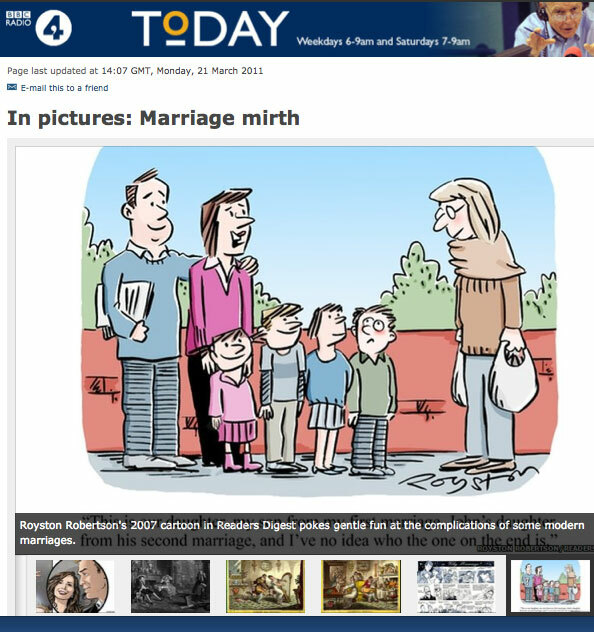 So I sent it in early 2011 and Private Eye took it, then used it in the week of the London Marathon in April. 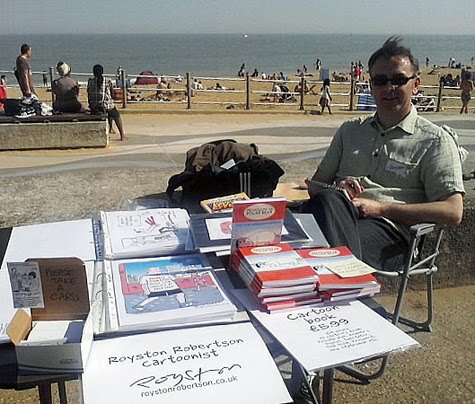 I was more than a little chuffed, when browsing in my local library here in Broadstairs, to come across a copy of my cartoon book. 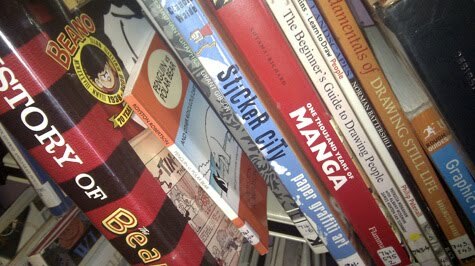 There it is, above, punching above its weight amid heftier tomes. I had heard that it was in there, I suppose it is a "supporting local artists" thing. Or, you could buy a copy. (Ideal Christmas present etc.) You can get it from Amazon and Lulu.com, but in the spirit of small enterprise I'd prefer it if you bought it directly from me, as I see more of the money that way: Visit my shop. "He only got this job because of who his dad is." After two posts about my social life (it's so rare that I have one!) it's time I posted a cartoon on this cartoon blog, so here's one from the November edition of Prospect. 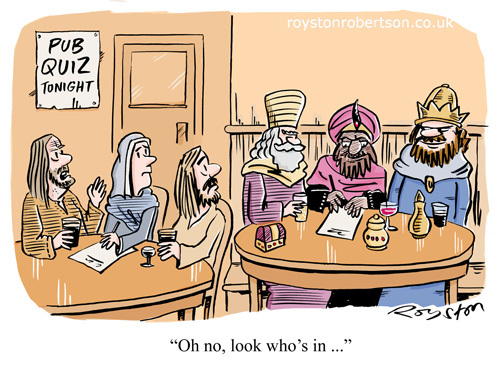 Watching BBC Four's Holy Flying Circus the other day reminded me how much Monty Python's Life of Brian opened the door to allow us all to be a bit non-reverential about religion. 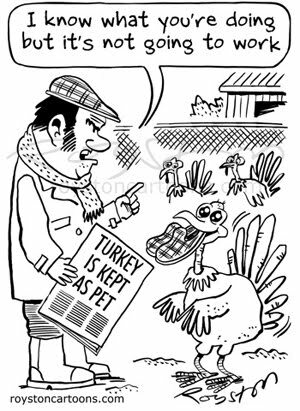 A cartoon like this may have ruffled a few feathers once, but it's hard to imagine anyone getting too worked up about it now. Actually, as a former Catholic (and altar boy!) I should probably think that's a bit of a shame. Cartoonists were outside their usual comfort zone at the Private Eye Golden Jubilee party on Wednesday -- the culmination of the magazine's 50th celebrations -- not because of the splendour of the venue, but rather the "smart dress" instruction on the invite. 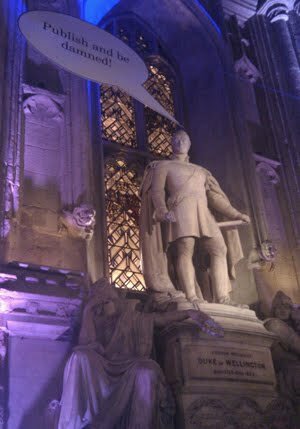 The grandeur of the Guildhall, in the City of London, was punctured by the placing of cutouts of famous Private Eye "victims" (Robert Maxwell, Andrew Neil etc) on the balconies, giant Private Eye crusader logos flanking the stage, and a few well-chosen speech bubbles, right. Last weekend I went on a trip to Somerset with the Cartoonists' Club of Great Britain, for the 2011 AGM/jolly. This, I should point out, was immediately prior to the Private Eye opening, so I had an heroic four days in a row of drinking and socialising. First time I've done that since I was a student, I think. There were 20-odd of us on the trip, a few of whom are pictured above, at Cheddar Gorge. Left to right: Nikki and Tim Harries, Simon Chadwick, me, Rich Skipworth, and Hugh "Shug" Raine. The photo is by Ger Whyman. I just wanted to send my thanks to the committee for organising such a brilliant weekend in Clevedon. I've been on a few of these trips now (Masham, Witney, Skegness etc) but I think this may have been the most fun yet. The weekend was filled with big laughs, good food and possibly a little too much drinking. 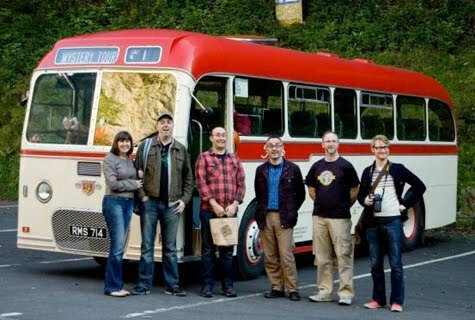 And the vintage bus trip, to Clevedon Pier, Thatchers for the cider tasting, and on to Cheddar Gorge, was just a perfect day. A team of us winning at the pub quiz on the Sunday night (commiserations to the other cartoonists' team!) was just the icing on the cake. We didn't even know there was a quiz on, but as Tim Harries had been posing quiz questions from his iPad all weekend, at every available opportunity, it was as if we'd been warming up! So thanks again to the committee and to everyone who turned up and helped make it a great weekend.